Go snorkeling and explore Hawaii’s vibrant coral reefs and unique sea life. We put together a list of a few of our favorite and best snorkeling beaches on Oahu. Snorkeling is a great activity for visitors of all ages and skill levels. There are lots of places to rent equipment throughout the island so all visitors need to do is set aside some time, find a good spot, and spend the day scoping out the vibrant sea life and beautiful shorelines of Hawaii. A wide variety of colorful fish and sea life can always be found in Hanauma Bay. Rent some snorkeling gear nearby and you’ll be sure to see a good sample of the Hawaii ocean life. Within the bay’s pristine and clear waters, you’ll have the opportunity to swim through this stunning reef teeming with rays, turtles, and diverse species of tropical fish. Pack a picnic lunch or some snacks and enjoy dining al fresco in the bay’s grassy picnic areas. Please note: non-residents must pay $7.50 to enter the nature preserve (children under 13 years of age and Hawaii residents get in for free) and Hanauma Bay Nature Preserve is closed on Tuesdays. The gentle surf, clear shallow waters, and sheltered shoreline make Kuilima Cove on the north shore a great place for novice or first-time snorkelers. Pack your beach gear and relax on the white sandy beaches after your snorkeling adventure. Located on the west side of the island, the clear, open waters of Kahe Point Beach Park make it a popular destination for snorkelers and divers alike. Despite its name, you will most likely not run into any shark danger while snorkeling in Sharks Cove (but you might be able to spot some white tipped reef sharks). Rent some snorkeling gear nearby and you can expect to see lots of fish and crustaceans who make a home in the unique lava formations making it a popular destination for divers too. Take some time to explore the tide pools here too. This is a great beach to spend the day at with its mile long white sand shoreline and clear waters. Although there are typically less fish at Kaena, the calm surf and lesser crowds allow visitors to leisurely snorkel and explore the waters. Go on a guided tour of Oahu and let your tour guide scope out a prime spot to give you the chance to snorkel with turtles as part of your Oahu tour experience. You’ll get a full day tour that takes you to Oahu’s major landmarks and hidden spots starting in Waikiki. You’ll go to Diamond Head Lookout, Halona Blowhole Lava Tube, Tropical Farms Hawaiian Coffee and Macnut sampling, visit some of the freshes tropical fruit stands and North Shore shrimp farms and food trucks, North Shore Oahu Beaches, turtle hotspots, and Dole Plantation — all in a day! Or, go at your own pace and rent snorkel gear in Waikiki for the day and choose your own spot to snorkel. Sunscreen and/or consider wearing a layer of UPF clothing to protect yourself from the sun (your back will be very exposed as you swim). 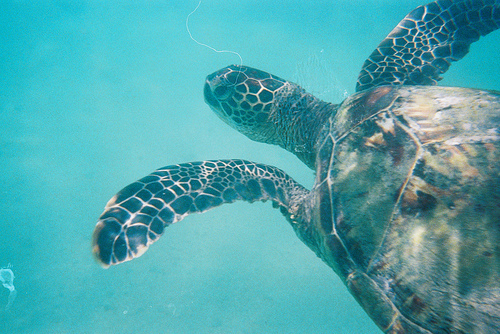 Bring a waterproof camera to get pictures of the vibrant sea life. Tip: make a day of it and pack a beach bag. Save up to 55% on snorkel gear rentals in Oahu and admission to over 30 additional activities for one low price with the Go Oahu® Card All-Inclusive Pass. The more you do, the more you save. Or, pick and choose things to do in Oahu when you build your own Oahu pass and save 20%, guaranteed when you buy 2 or more attractions.